Google Docs added a simple editor for drawings: you can insert shapes, draw lines and arrows, insert scribbles and text, change the color, the line width and other formatting options. 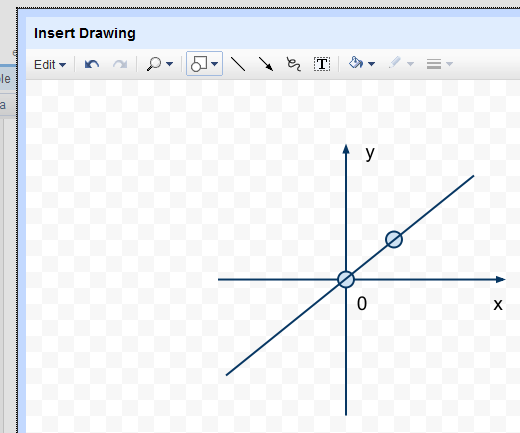 The drawing is inserted as an image, but it continues to be editable after you add it to the document. Google uses SVG in Firefox, Opera, Chrome and other browsers that support it and VML in Internet Explorer, so you don't need third-party plug-ins. To try this feature, called internally Sketchy, go to the "Insert" menu and select "Drawing". This is one of the few features that works for all types of files that can be edited in Google Docs: documents, spreadsheets and presentations. It doesn't work well when two or more people edit the same drawing simultaneously and the interface is confusing: when you finish editing your drawing, you need to click on the "X" icon. Very nice feature! I can finally get rid of Microsoft Office. Yeah, good bye office. Also, I find the interface very user friendly and not confusing at all. Figures obtained by a very nice and neat. We would still like to have a simple 3D-editor to create drawings in space. Then just when you have such a supplement would make their product more competitive! Great feature that was sorely missing in Docs. Glad to see it implemented. If only they would add support for equations I would dump office all together. Yes!!! Just one step closer to the white board that I've been asking for since Docs came out. I just gave it a try. I love that the tool has a copy/paste capability. Draw something, and if you want to use a mirror image of it somewhere else in the picture, just copy it and rotate it horizontally. The clip art stuff is nice, too. I even started this drawing in another doc, copied it and pasted it into a new doc. Fantastic functionality. Well this is really a great alternative for MS office. Thanks for sharing! Its a pretty good start to a much needed drawing functionality in Docs. I like that most shapes can be further adjusted with sizing handles. Going forward, I would like to see a way to insert images into the drawing as an object or background, finer control over the final drawing size within the doc (replacing the current smaller, bigger options), real 'connector' shapes (Excel has these - good for flowcharts) and changing font attributes in all shapes (not just Word Art). Also, they need a new folder type in the Docs list (ie Drawings) for these images so they can be easily saved for future use in other docs or shared. They need to get export working. Rather embarrassing that after you do a drawing you can't get it out in any of the export formats or even print it. They need to do some basic testing on these things before announcing them. Have Google disabled "Albums" in Doc List? How to post docs with drawings into blog (for exam - into blogger account)? It seems that blogger engine has no support for new docs drawings? I think it needs "smart connectors" (more like Visio). Also, how do you copy/paste entire drawings between documents? Can I copy and paste a drawing from a text file to a presentation? Excellent Tool..Still needs to get more tools to get rid of using visio.. When will we able to save them and import them to other apps? It is possible to add greek alphabet in drawing ? Nice! I need "smart connectors" and the ability to export as XML. Then I can use it to collaboratively edit work-flows and transform the output to BPMN/BPEL. I will make all the transforms open source if you add this feature. but how to draw like i were with a pen? that is the things that matters to me. CAN YOU USES DRAWING ON DOCS TO DRAW SIMPLE LINES/POLY/TEXT OVER AND EXISTING PREIMPORTED IMAGE IN THE DOC? WANT TO ADD A LAYER ONTOP OF THE EXISTING JPG THATS IN THE DOC.... HOW ? OVER USE LAYER TO SEND THE ORIG JPG TO BACKGROUND AND MOVE THE DRAWING ITEMS OVER THE JPG IN THE FRONT LAYER?